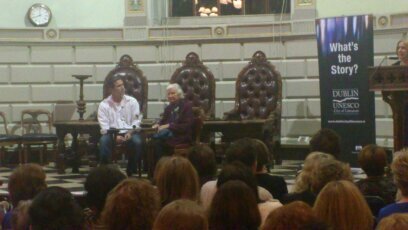 It was a real treat to listen to PD James the other night when she was interviewed by Irish crime novelist Declan Burke. It was put on by Dublin UNESCO City of Literature and Trinity’s School of English, and the crowd in the Examinations Hall were treated royally by the Queen of Crime Fiction. For a woman who turned 93 in August she was very clear and precise, and as the person beside me said quietly ‘she’s as sharp as a tack’. I could only agree. She was talking about her latest book ‘Death Comes to Pemberley‘ which is an homage to Jane Austen’s Pride and Prejudice. James has always loved Austen’s work and wrote her book as a sequel to Pride which is celebrating 200 years (published in January 1813). All the usual characters are in it and James’s inclusion of a murder should make for an interesting read. During the Question & Answer session that followed the interview she told us that she was inspired by Dorothy L Sayers rather than Agatha Christie. ‘A good book is a good book, whether it is a detective book or not.’ She found writing crime novels ‘reassuring and a chance to bring order out of disorder’. And, being a fan of her policeman character Adam Dalgliesh, it was great to find out that he may appear in her next book. ‘Let’s hope there will be one last one to come.’ Again, I must agree. 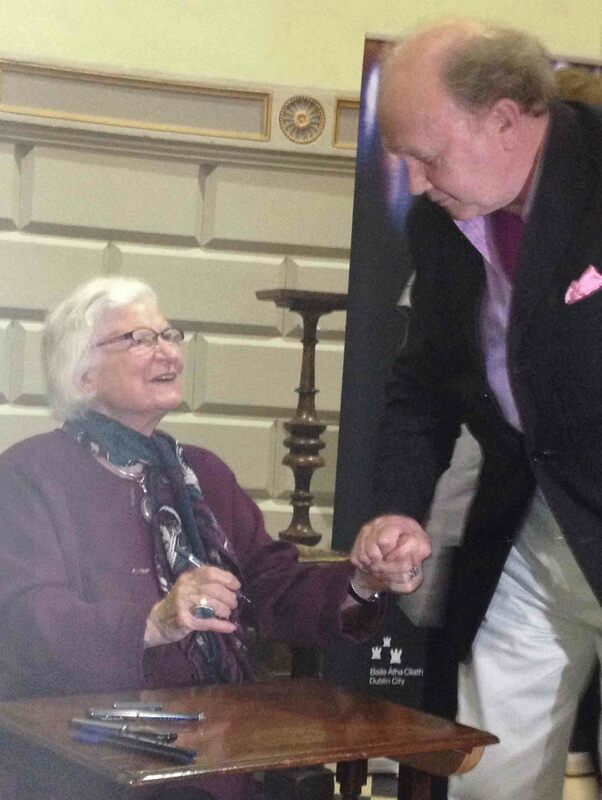 PD James after signing my book! Saturday started warm and sunny and, thankfully, stayed that way. 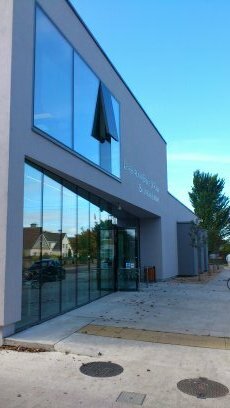 It was a perfect day for Open House events and I decided to ‘stay local’ and visit two buildings in Rathfarnham. Both of these were on the interesting and informative double-sided poster, which has already turned into a ‘collector’s item’. Well done to its designers, as I am sure that it played its part in attracting many visitors who were willing to ‘check things out’ and, as a result, enjoy spaces not usually open to them. Next on my list was St Enda’s. This is the old building where Padraig Pearse opened his school in 1910, determined to give pupils a broader and more balanced education. He had spent time in Belgium, liked the way pupils were taught bilingually and decided to adopt this teaching method in Ireland. It was popular and the school attracted many students. However, with Pearse’s growing involvement in republican matters, the school inevitably suffered. After he and his brother Willie, along with Thomas McDonagh (a teacher and signatory of the Proclamation of Independence) were executed for the part in the Easter Rising the school went into decline. It was run, for a time by their mother who with the influx of funds after the executions was able to buy the property. However, due to the falling numbers of pupils the school closed its doors for the last time in 1935. 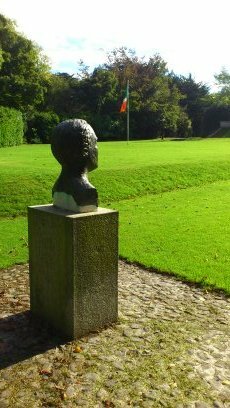 After Pearse’s sister (Margaret Mary Pearse) died in 1968 ownership of the property was transferred to the State. Recently, the building has been extensively renovated with many of the rooms now on show as they were in Pearse’s time, namely; his study, the sitting-room, art gallery (with a number of sculptures by Willie Pearse) and a pupils’ dormitory. A large timber block upon which Robert Emmet was decapitated is an interesting, if little publicised, item of historical interest. 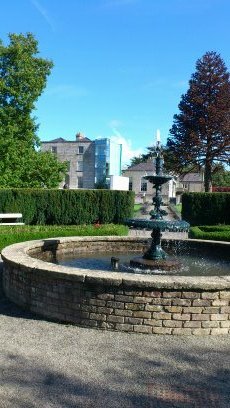 Outside, the gardens, paths and bubbling fountain are a perfect place for a walk and quiet reflection. It’s a hidden gem! 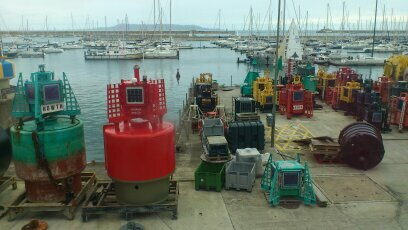 Buoy, oh buoy, oh buoy…. The sun was not as obliging today, but it was still very mild and just right for trip to the sea. I headed to Dun Laoghaire and to a building that I have passed by on countless occasions, but never entered. The Headquarters of the Commissioners of Irish Lights building is a real eye catcher and was well worth the visit. Designed by the Dublin architects Scott Tallon Walker the building resembles a lighthouse, showing the essence of the organisation. 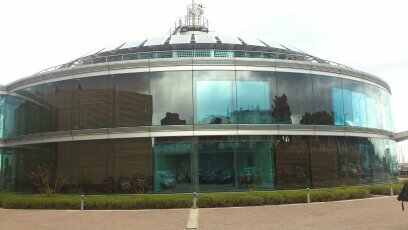 Inside, the large amount of glass gives a sense of lightness and it feels as if the place is floating on the sea. The almost 360-degree views are spectacular, none more so than those from the Board Room. The uninterrupted view across Dublin Bay was memorable! The central staircase twists like a double-helix DNA molecule, and everywhere gives the feeling of being at the cutting edge. The fifty minute tour with our guide Rory (yes, he works there!) was very informative, and it was an Open House event I am glad to have attended. Put it in your diary for next year! Building or spaceship: a must-see! The weather has been, thankfully, very kind this year. After so many miserable ‘summers’ with rain falling much too often, and grey skies the order of the day, almost everyday, strolling along St Stephen’s Green which was bathed in late-September sunshine, was a delayed and exciting pleasure. 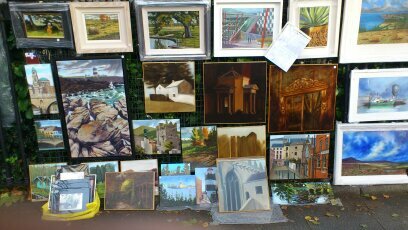 The air was warm, the talk lively and everywhere there were paintings. 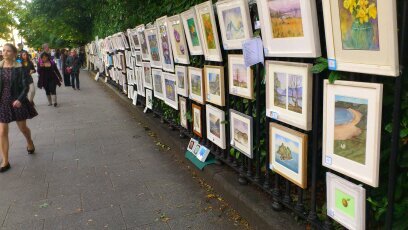 Hundreds and hundreds of them in the biggest outdoor gallery the city could put on. You could be forgiven for thinking that you were walking in Paris or Florence such was the atmosphere and setting. Dublin – she looked great! The exhibition, Peoples’ Art, is one of five such exhibitions held this year (the final one will be in early Dec) and is open to any artist, and as a result there is much to see and enjoy. Many established artists show their work alongside that of local amateurs. As that old saying goes ‘It’s all in the eye of the beholder,’ and when I passed along the crammed railings there were many beholders getting up close and interested. I could hear talk about where a certain painting was done, its inspiration and how was business going? Pretty good, I think, with the number of handshakes and smiles I saw. Buying a painting is one thing, but haggling with the artist over its price is just as important and a big part of the experience. It may not be like buying in Sotheby’s or Christie’s but a deal is a deal, and the success of the exhibition shows that a lot of haggling was done. Long may it continue, as the colourful spectacle is a real crowd pleaser even if you only walk by, slowly, of course, and enjoy the artistic pleasures on show.